1) This paper has been prepared and presented at the FIG Working Week / GSDI-8 Conference in Cairo, Egypt, April 16-21, 2005. In the introduction to the New Partnership for Africa's Development (NEPAD) dated October 2001, African leaders recognised "that they have a pressing duty to eradicate poverty and to place their countries, both individually and collectively, on a path of sustainable development, and, at the same time, to participate actively in the world economy and body politics." Many of the objectives and initiatives of NEPAD depend on the establishment and maintenance of sound regional or continental infrastructure of reliable geo-spatial information. It is essential, therefore, that the co-ordinate systems or foundation on which that information is based be both uniform and based on modern positioning technology throughout the region. 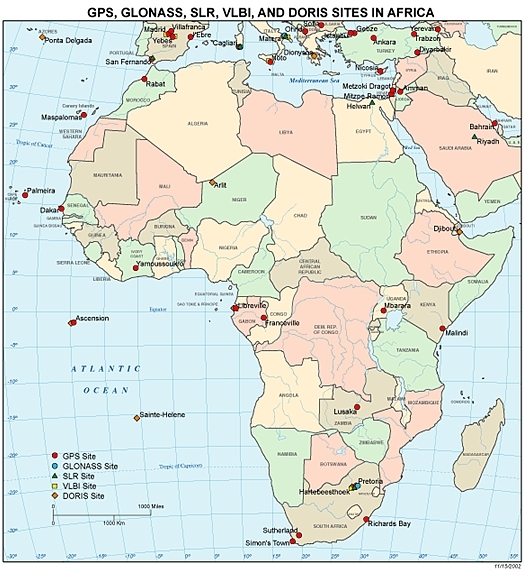 The Africa Reference Framework project (AFREF) is an African initiative with international support designed to unify the co-ordinate reference systems in Africa using Global Navigation Satellite Systems (GNSS) and, in particular, the Global Positioning System (GPS) as the primary positioning tool. The outcome of this project will be a uniform and consistent co-ordinate system covering Africa to be used as the fundamental reference system for all regional and continental geo-spatial information and planning and development projects across a wide spectrum of disciplines. The AFREF project will, therefore, support the goals and initiatives of NEPAD. The fundamental point of departure for any project, application, service or product which is reliant on some form of geo-referencing, must be a uniform and reliable co-ordinate reference system. Geographic information services and products provide the link between all activities and the places or locations where those activities take place. One does not build a house without a foundation or secure frame. Most countries have developed co-ordinate reference systems and frames which are used for national surveying, mapping, remote sensing, Geographical Information Systems (GIS) and development programmes. Although these systems are in existence in many countries, the state of repair and extent of their applications varies considerably. There are over 50 countries in Africa all of which are considered as developing nations and each with is own difficulties and challenges. Each of these countries have their own co-ordinate reference system and frame. Additionally, there are some countries that have more than one system each based on a different datum. A number of the former British colonies in Southern and East Africa adopted the Cape Datum co-ordinate system based on the Clarke 1880 spheroid but even these countries have different realizations of what, in name, is the same thing. Although there remain a number of areas of conflict within Africa, there are also a number of regions where peace has been restored. With the restoration of peace has come the resurgence of development of these regions. The need to coordinate planning and development efforts within countries and across national borders in line with the ideals of NEPAD has become paramount and cannot be achieved successfully if the fundamental point of departure for these planning projects, i.e. the co-ordinate reference frame, is not uniform and of an appropriate modern standard (Windhoek Declaration, 2002). Figure 1: AFREF is conceived as unifying the national reference frames of Africa into a common reference frame for the continent. The African Geodetic Reference Frame (AFREF) is conceived, therefore, as a unified geodetic reference frame for Africa. It will be the fundamental basis for the national three-dimensional reference networks fully consistent and homogeneous with the International Terrestrial Reference Frame (ITRF). When fully implemented, it will consist of a network of continuous, permanent GPS stations such that a user anywhere in Africa would have free access to and would be, at most, 1000km from such stations. Full implementation will include a unified vertical datum and support for efforts to establish a precise African geoid, in concert with the African Geoid project activities (Wonnacott, 2003). Apart from being fundamental to all infrastructure, planning and development projects, AFREF and the network of permanent GPS base stations upon which it will be based, has vast potential for the promotion of geodesy and surveying, geo-information, earth and atmospheric science, disaster mitigation, the monitoring of crop and vegetation distribution and animal migration patterns. The implementation of AFREF and its applications will provide a major platform for the enhancement of skills and skills transfer in these sciences and further some of the objectives and actions of the NEPAD science and technology platform. Prior to the introduction of GPS as an easily accessible positioning tool, the US Navy Navigation Satellite System (US NNSS), TRANSIT, was available to the geodetic and surveying community. The system was commonly known as the Doppler positioning system primarily because of the observing principal upon which it was based. In order to achieve the accuracies required for geodetic applications, it was essential that at least two receivers, preferably more, observed and recorded the Doppler shifted satellite transmitted frequencies simultaneously. The logistics of a survey extending over large areas with an inter-station spacing of 500 km or more was not easy to ensure that all stations recorded data simultaneously particularly with the added difficulty of poor telecommunications between stations. to provide an accurate geoid for Africa. the bilateral agreements between countries and sister organisations did not always materialize. Although ADOS failed to meet its primary objectives, it did serve to provide a number of valuable lessons which will be carried forward into the AFREF project. Perhaps the most significant differences between the two projects has been the change in positioning technology notably the introduction of GPS, the concept of continuously operating GPS base stations, the establishment of the International GPS Service (IGS) and its global network of GPS base stations and the services and products derived from the IGS. It is now no longer essential that all roving receivers operate simultaneously since one is able to rely on the IGS infrastructure of base stations. A set of standards and procedures has been introduced by the IGS for the establishment of permanent base stations. Apart from the technological changes, the fact that African countries are actively involved in the planning, managing and execution of AFREF will be a major positive feature and difference between this project and ADOS. Projects with similar goals and objectives have been undertaken elsewhere in the world. The European Reference Frame (EUREF) is perhaps the longest running and best established project of this nature to have been undertaken. EUREF was founded in 1987 as a Sub-Commission within the IAG and deals with the definition, realization and maintenance of the reference frame for Europe. It has matured to the stage where there are clearly defined sets of activities such as the establishment and maintenance of the European Terrestrial Reference System and European Vertical Reference System. These activities are based on a network of permanent GPS/GLONASS receivers (EUREF, 2005). Similar projects have been established for South and Central America (SIRGAS), Asia-Pacific, North America and, although not entirely the same as others, Antarctica all of which are represented as Sub-Commissions of the IAG. Since the Global Spatial Data Infrastructure meeting held in Cape Town in March 2000, where the need for a unified reference frame for Africa was first expressed, many meetings and workshops have been held to deal with AFREF either directly or indirectly. Currently, there are nearly 25 countries throughout Africa that have expressed interest in AFREF while the number of international organisations with interest in AFREF has also increased since the project was first proposed. Perhaps the first meeting or workshop since the completion of ADOS dedicated to the unification of reference frames in Africa was held in Tunisia in May 2000. This workshop was attended by 6 North African countries and was largely of an exploratory nature to find ways and means of unifying datums in the region (Altamimi, 2004). A similar, but unrelated meeting dedicated to AFREF, was held in Cape Town in March 2001 as part of the Conference of Southern African Surveyors (CONSAS). The purpose of this meeting was largely to try to gauge the level of interest in the project. Representatives attending the meeting were mainly from the National Mapping Organisations of Southern African countries as well as representatives from the IAG, IGS and EUREF. The consensus of opinion from attendees was that the project should go ahead and that the IAG should be the lead international organisation to give AFREF the necessary technical support. It was also recognised that AFREF must include both the horizontal and vertical components of a unified continental reference frame similar to EUREF. It was also recognised at this meeting that the logistics of undertaking such a project involving the more than 50 African countries simultaneously would probably result in failure and that it should be organized on a regional basis. This concept has now become one of the fundamentals of the current organisational structure of AFREF. “Establish a continental reference for Africa, or African Reference Frame (AFREF), consistent with the International Terrestrial Reference Frame (ITRF)”. The next important milestone was a workshop held in Windhoek, Namibia in December 2002 prior to the Regional Centre for Mapping of Resources for Development (RCMRD) technical meetings. The important feature of the workshop was the preparation of the “Windhoek Declaration” in which the 8 Southern and East African countries represented at the meeting including the RCMRD, committed themselves to support AFREF and its objectives and principles. The declaration was accepted by the United Nations Committee for Development Information (CODI) and formed the basis upon which CODI - Geographical Information (CODI-GEO) established an AFREF working group in August 2004. Assist in establishing in-country expertise for implementation, operations, processing and analyses of modern geodetic techniques, primarily GPS. One of the driving principles upon which AFREF has been established is that the project must be designed, managed and executed from within Africa with technical assistance and expertise being provided by the international geodetic community. In addition to this, the concept of continental coordination with regional and national implementation has been paramount. The structure of the CODI-GEO Working Group on AFREF was accepted at a workshop hosted by the African Association of Remote Sensing of the Environment (AARSE) in Nairobi in October 2004. The general organizational structure of the working group is given in figure 2. 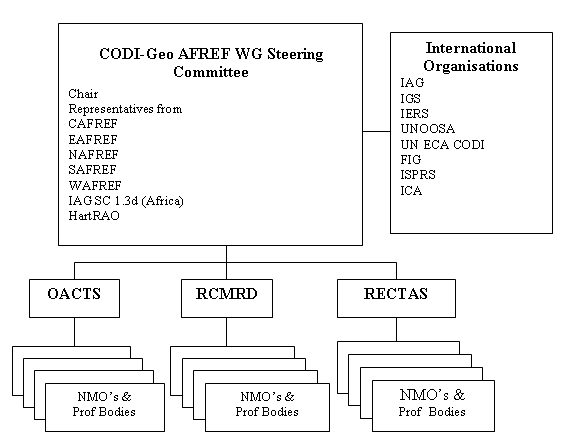 Figure 2: Organizational structure of CODI-GEO Working Group on AFREF. technical expertise and support will come from the international geodetic community. The importance of the regional centres cannot be underplayed as, collectively they already represent a reasonably high percentage of African countries. They have an important role to play in the “regional” aspect of AFREF and are better equipped to communicate and liaise with their member countries. Starting from the North, l'Organisation Africaine de Cartographie et de Teledetection (OACT) represents largely the Arab speaking countries of that region, while in West Africa, the Regional Centre for Training in Aerospace Surveys (RECTAS) represents both French and English speaking West African countries. The Regional Centre for Mapping of Resources for Development (RCMRD) represents a reasonably large number of East and Southern African countries. Perhaps the most important role players in the project are the National Mapping Organisations. The NMO’s are going to be responsible for the implementation of all phases of the project from the installation and operation of GPS base stations right through to the final conversion to ITRF of the National reference frames for which they are responsible. Even once the conversion is complete, historical data based on previous systems will also have to be converted where necessary. This is particularly the case of cadastral records for taxation purposes and to ensure the continuity of security of title. The Hartebeesthoek Radio Astronomy Observatory (Hart RAO) in South Africa also has an important role to play in AFREF as it is the only facility in Africa that is a regional data centre for the IGS and it is therefore natural that all data generated by the permanent GPS base stations should be archived at HartRAO. This, however, does not exclude the regional centres from archiving data from their respective regions. HartRAO is also important in that it is one of very few facilities globally where VLBI, SLR, GPS, DORIS and GLONASS are all co-located at the same site. From an organizational point of view, a working group has been established by CODI-GEO to manage AFREF which enjoys the support of numerous international organizations that are capable of giving the project technical support. Apart from technical support, these organizations, which include the IAG, IGS, IERS, UNOOSA, UNECA CODI, FIG, ICA and ISPRS among others, are able to leverage financial assistance from donor organisations, countries and equipment manufacturers. To strengthen this support, the IAG has established Sub-Commission 1.3d Africa within its Commission 1 Reference Frames. In addition to the establishment of this Sub-Commission, the IGS, a service organization of the IAG has come out very strongly in support of AFREF. From an infrastructure point of view, there are already at least 15 IGS stations in Africa equipped with GPS receivers. The quality and regularity of data reception from these stations varies considerably and although it would appear that a station exists at a certain location, a continuous flow of data may be somewhat intermittent or even have ceased altogether. There are also a number of continuously operating base stations which have been installed according to IGS standards but have not been registered as such. This is the case within South Africa where a network of 35 stations is currently in operation. There may be other similar cases such as continuous base stations at major airports or scientific institutions and which may be suitable IGS stations provided some antenna and receiver upgrades are undertaken. Figure 3 shows the distribution of IGS registered space observing techniques in Africa. There are many contractors and developers working in Africa who require geospatial information and maps as part of their contracts. The mapping and geospatial information that is available from the NMO’s is normally based on the National co-ordinate systems currently in use in the particular country. These are based on old reference frames and are generally not compatible with modern positioning technology and the GPS reference frame, WGS84. The result is that, although contractors use GPS as the fundamental positioning tool, a multitude of loosely related local co-ordinate systems are being established. At the national level, South Africa converted to ITRF91 (epoch 1994.0) from the beginning of 1999 after recomputing the entire network using original terrestrial observations and a selection of about 200 points which were surveyed by GPS. The process was extremely time consuming but has resulted in a very “clean” reference frame (Newling 1993, Wonnacott 1997). Botswana converted to an ITRF2000 based reference framework in 2002 and in the process used GPS data derived from the South African network of permanent base stations in addition to data from a number of IGS points. The latter point is important in that it shows that meaningful GPS observations can be undertaken even though no base stations are available within one’s own country. With organisational structures in place to deal with AFREF and a wide range of international organisations having committed themselves to giving the project their support, the time is fast approaching to commence with the establishment of a continental wide network of permanent GPS base stations. Clearly, funding for the purchase of receivers and ancillary equipment is necessary and perhaps the next phase will be to secure sufficient funding to install an intial network of about 25 base stations throughout Africa. Besides the cost of equipment and installation, ongoing funding will be required for telecommunication and maintenance of the network to ensure a continuous flow of data and to maintain the network. Experience has shown that although such networks are called “continuous”, this is very rarely the case because of various equipment, power and telecommunication failures which all require some form of maintenance funding. It has been estimated that the cost of equipment for 25 stations will be approximately $US1.1 million while telecommunication and maintenance costs for these stations will be approximately $US50000 per annum. the stability of the antenna monument foundation and clear sky view are critical success factors from a geodetic point of view. Site selection is going to be a task that will rely heavily on the local knowledge of the NMO’s and here major airport, Government and University buildings or surrounds could be considered for the construction of antenna sites. The installation and operation of a network of permanent base stations is the first phase of the AFREF project. The whole purpose of the project is to convert the current national reference frames to internationally accepted system such as the ITRF2000 to be able to unify the systems throughout Africa. This will entail a great deal of work, effort and commitment by African NMO’s to survey, process and carry out the computations using the permanent base stations as a fundamental reference frame. The conversion of all mapping and other geospatial information will follow and will probably take even longer than the conversion to an ITRF based co-ordinate system. Although the Africa Geoid project falls under a different IAG commission, AFREF and this project are, nevertheless, complementary. The goals and objectives of AFREF will support and satisfy many of the objectives of NEPAD. An organisational structure is in place that reflects the fundamental principle that the project be planned, managed and executed by Africans with technical assistance and support from the international geodetic community. The time is ripe, therefore, to commence with the first phase of the project notably the installation of a network permanent GNSS stations. The project must not be considered as a short term one and will take a number of years to complete which require the long-term commitment of National Mapping Organisations. As stated in the Windhoek Declaration, the attainment of a unified three dimensional geodetic reference frame for Africa is not the only major objective of the project. The transfer of the skills to Africa necessary to undertake a project of this nature and to create a large pool of geodesists, surveyors, IT specialists and related skills is of paramount importance for the future success of similar continental, regional, national or local projects. Altamimi, Z (2004): “Status of AFREF Project.” Proceedings of International GPS Service 10th Anniversary Symposium, Bern, Switzerland, March 1-5 2004. EUREF (2005): http://www.euref-iag.net viewed 15 January 2005. IAG (2003): http://www.ceegs.ohio-state.edu/iag-commission2/cp2.3.htm viewed 20 January 2005. NEPAD, (2001): http://www.nepad.org/en.html viewed 14 January 2005. Neilan, R, & Wonnacott, R (2002): “Establishing A Continental Reference System in Africa: AFREF” Proposal to International Council for Science on behalf of International Union of Geodesy and Geophysics/International Association of Geodesy, International GPS Service/International Earth Rotation Service and International Society of Photogrammetry and Remote Sensing. Newling, M (1993): “The South African GPS Control Survey.” Proceedings of the Tenth Conference of Southern African Surveyors, Sun City, South Africa, 1993. Richard Wonnacott completed a BSc Survey degree at the University of Cape Town (UCT), South Africa in 1974 and registered as a professional land surveyor in 1976. He has been employed by the Chief Directorate: Surveys and Mapping (CDSM) since 1976. He has had extensive experience in geodetic fieldwork and computations including geodetic astronomy, primary triangulation and Doppler and GPS surveying in South Africa and Antarctica. He initiated and is currently project manager for the South African network of permanent GPS base stations and is a Director within CDSM with the responsibility for all geodetic and mapping functions. He has presented papers at numerous national and international conferences and was the South African National correspondent and representative to IAG from 1993 to 2004. He is currently the Chairman of IAG Sub-Commission 1.3d Africa and is a member of the CODI-GEO Steering committee on AFREF. He is also an Associate Member of the IGS.